This topic contains 1 reply, has 2 voices, and was last updated by Sebastian 2 months, 2 weeks ago. 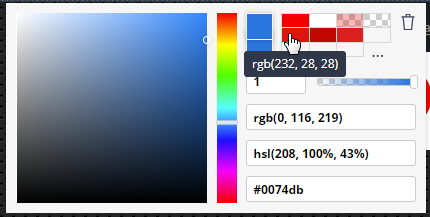 The tooltip that is shown when hovering over a color in the colorpicker does not respect the “Report color in hex values instead of RGB/A” setting in Preferences. I have mine set to Yes but the tooltip still shows the color values in RGB. PS: BTW, Sebastian, is there a way that you enable attachments in the forum? This would make attaching screenshots much more easy than having to upload to a separate image storage and copy the links. I’ve just released version 5.5.3.6 which fixes the color pick hex issue. And regarding image uploads – noted. I’ll look into secure ways of allowing that.